This mushroom is widely distributed in North America . . . by trucks, most of which were loaded up in southeastern Pennsylvania. Agaricus bisporus is so common that its common name is simply "mushroom." According to the USDA, it is cultivated by mushroom farmers to the tune of roughly $1 billion each year, during which the average American consumes more than 2 pounds of mushrooms! 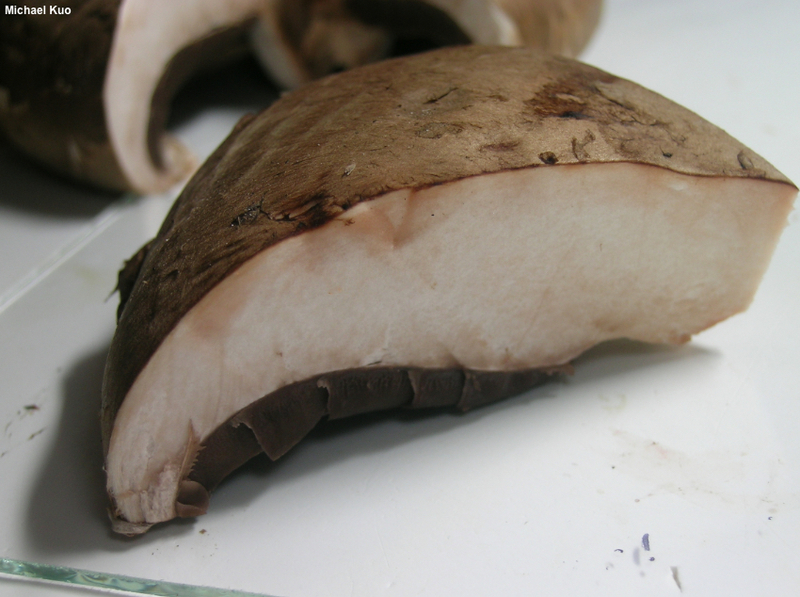 The common grocery store form of Agaricus bisporus is completely white, but in recent years the mushroom industry has developed brown strains of the species, which it markets as "crimini" and "portobello" mushrooms (the distinction is simply that the portobellos have been allowed to mature past the button stage). Both of these forms are illustrated to the right. 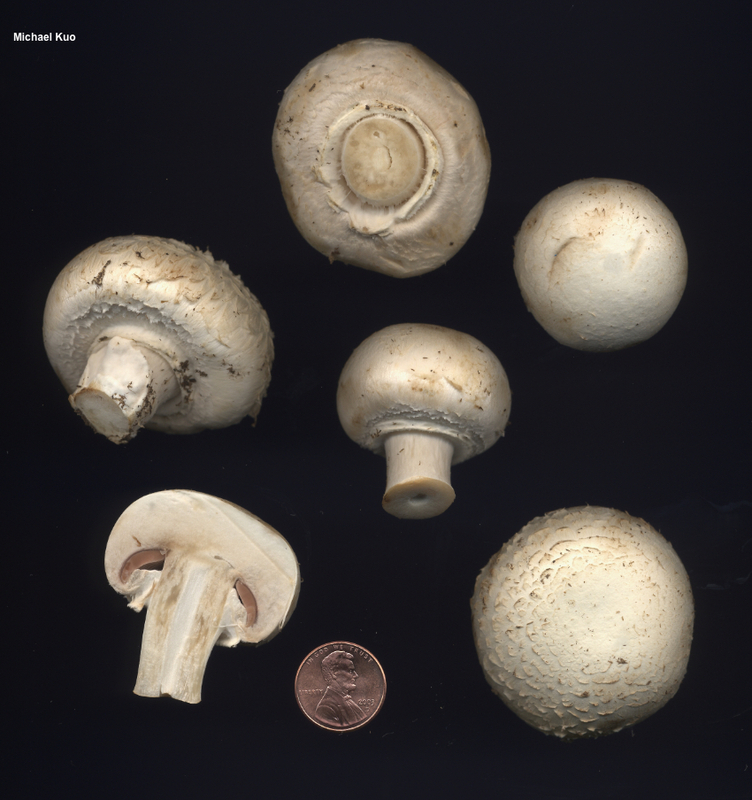 A 1995 study by Kerrigan and collaborators found that Agaricus bisporus exists in North America—outside of grocery stores and restaurants—both as a native species and as an introduced species. Genetically distinct, genuine North American populations are recorded from coastal California (under Monterey cypress), montane New Mexico, and montane Alberta (under spruce). All other studied North American populations represent "escapees" from mushroom cultivation and consumption, and have European genetic roots. I have not seen or collected any of the native forms of Agaricus bisporus; nor have I seen any escapees from cultivation. 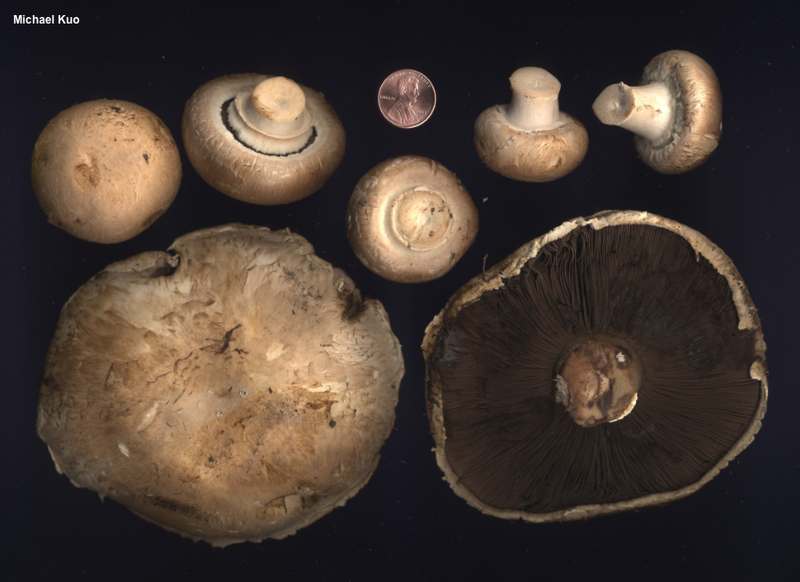 As its species epithet indicates, the distinguishing feature of Agaricus bisporus is microscopic: unlike most other species of Agaricus, its basidia bear two spores each, instead of four. 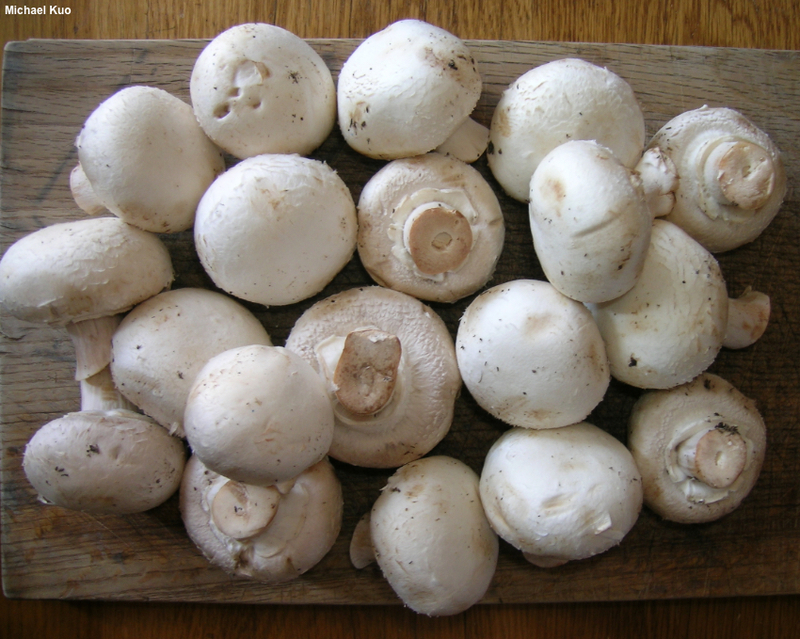 Agaricus brunnescens is a synonym. Ecology: Scattered on pizzas, gregarious on salads, densely clustered in grocery stores—and occasionally scattered to gregarious on manured soil, compost piles, in lawns, and so on, as a native species and as an escapee from cultivation (see discussion above), especially in coastal California. The illustrated and described collections were purchased in Illinois grocery stores. Cap: 2.5–14 cm, convex to nearly round at first, expanding to broadly convex or nearly flat; dry; bald or with pressed-down fibers or very small scales; white in some cultivated varieties, brown in others; often bruising pinkish to reddish when rubbed. 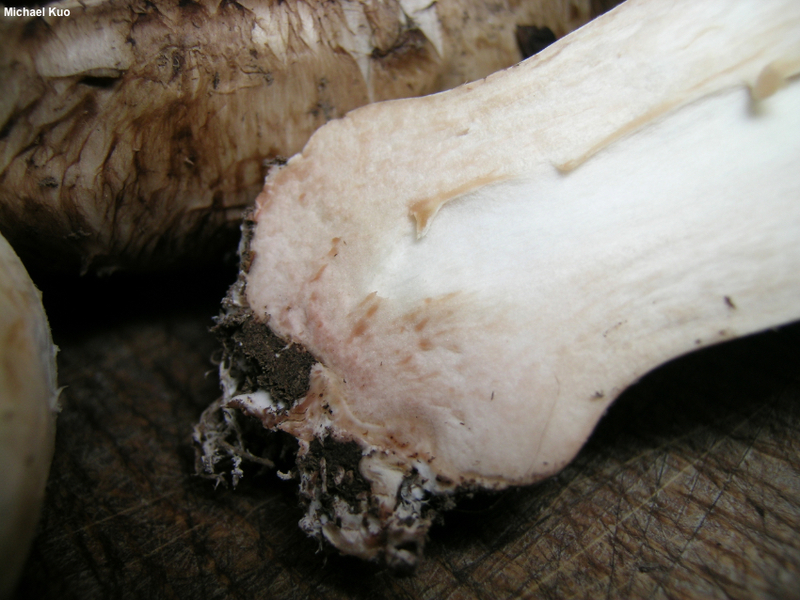 Gills: Free from the stem; close; short-gills frequent; pinkish to pink at first, becoming dark brown to nearly black. 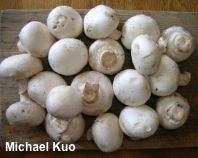 Stem: 2–7 cm long; 1–2.5 cm thick; more or less equal; bald or with small scales; white, often bruising reddish to brownish; with a thin ring that sometimes disappears in maturity. Flesh: White and firm; usually bruising and staining pinkish to reddish, then slowly brownish. 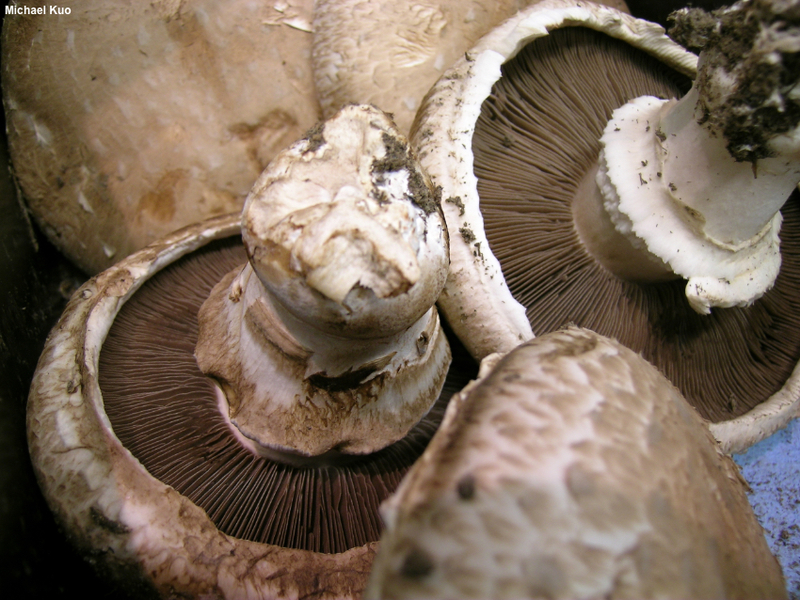 Spore Print: Dark brown—but sometimes difficult to obtain from store-bought mushrooms. 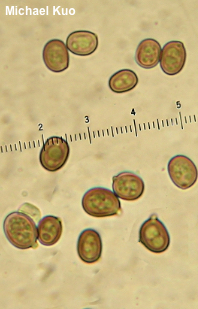 Microscopic Features: Spores 6–8 x 5–6 µm; ellipsoid; smooth; thick-walled; brownish in KOH. Basidia mostly 2-spored. 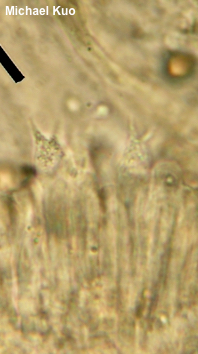 Cheilocystidia 20–30 µm long; clavate; smooth; thin-walled; hyaline in KOH. Pleurocystidia not found.